When you talk to your children about the subject of race, it can help them to form stronger bonds with their transracially-adopted siblings. Do you already have children and are considering adopting a child from a race that is different from yours? There are many things to be aware of before adopting a child of a different race. It’s important to address your own hidden biases and to prepare your home and lifestyle to celebrate the experience of a child from a race that is different from your own. Another essential step is preparing your family. Young children in the family may find it confusing to have a new sibling who doesn’t look like them. As children can be concrete thinkers, they may see difference and not know how to make it fit in their world. They may experience the racial tension experienced by others and not know how to deal with it. It’s important to talk with them about how they can understand difference and welcome diversity. Talk about it – introduce the discussion. The first thing to do before introducing your children to a new transracially-adopted sibling is talk with them about race, prejudice and your feelings on diversity. This is often an entirely new subject for most children and they will be receptive to learning about it from you. There are several great books you can read with your children that explain how children can support their friends, peers, and siblings from different races. When talking about racial difference and diversity, it’s important to emphasize that racism is learned and does not “have to be.” Children can learn that racism and prejudice don’t happen because of skin color. They happen because people choose to make the decision to be mean to others who are different from themselves. Parents can explain that racism is a problem of how people treat other people. When you teach your ideals and principles around diversity, your child will project your ideals and principles and be better prepared to filter what they may experience outside of their home. There will inevitably come a time when your child will notice a difference between himself/herself and his/her new sibling. 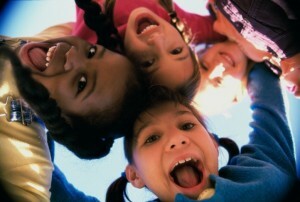 Children’s peers may start to ask them why their new sibling is from a different race. These situations can lead a child to have questions that they may not even know how to express. Biracial families are still sometimes viewed as “different”. Your biological children and adopted children may experience bullying during social situations at school and/or in the community. These are the times when your children will need you as a guide. You would already have been talking openly and positively about race in your home, so your child will already have positive language in their head. Keep up positive, open communication with your children. Ask them often about their experiences around racial differences. An essential part of any adjustment experience for your child is the knowledge you are listening, understanding, and supportive. As a family, you can develop strategies to manage what people say about your family, positive or negative. You can help your child understand the difference between curiosity around a transracial adoption and negative statements around a transracial adoption. You can establish a plan to manage negative statements. You can prepare your child with strategies such as ignore what people say, seek assistance from a teacher or counselor, and/or make positive prideful statements about your family. Always remind your children that they can bring these challenges home to you for help and support. These are just the guidelines for longer conversations around transracial adoptions. Again, the most important things are to talk openly about your transracial adoption, let your children know that you are there to listen, help, and support them. This entry was posted on Monday, January 25th, 2016	at 9:53 am	. You can follow any responses to this entry through the RSS 2.0	feed. Both comments and pings are currently closed.